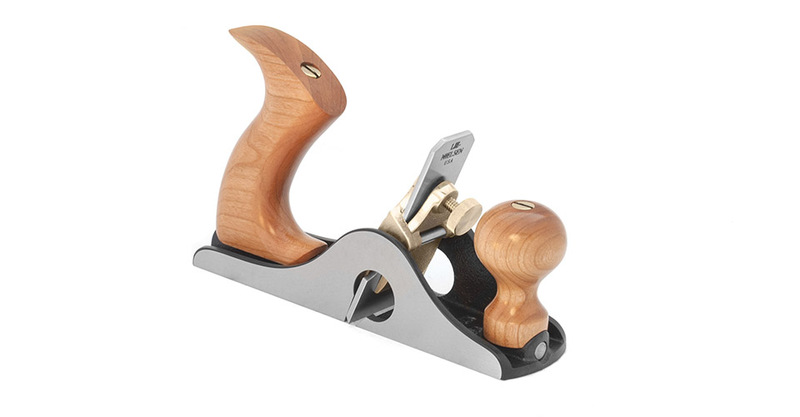 This elegant Scraping Plane, comfortably sized between our large and small Scraping Planes, is based on the Stanley No. 85. The blade extends the full width of the base and allows you to work right into a corner, such as a fielded panel. The tilting knob and handle offer clearance for your knuckles when scraping inside a box or on a wide, deep rabbet. Frog is fixed. Ductile Iron body, 3 lbs. Stanley’s No. 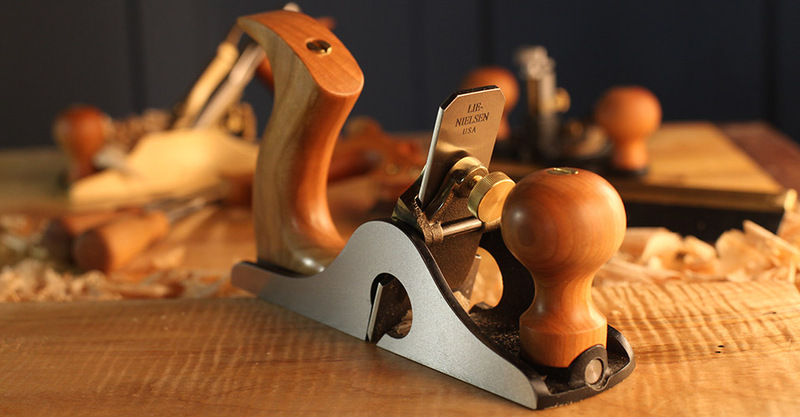 85 Cabinet Maker’s Scraper plane is a much sought after collectible, commanding high prices. Consequently, until now, few people had the opportunity to own one to use. This is a fine scraper — not prone to chatter, because the blade is bedded directly against the plane body. 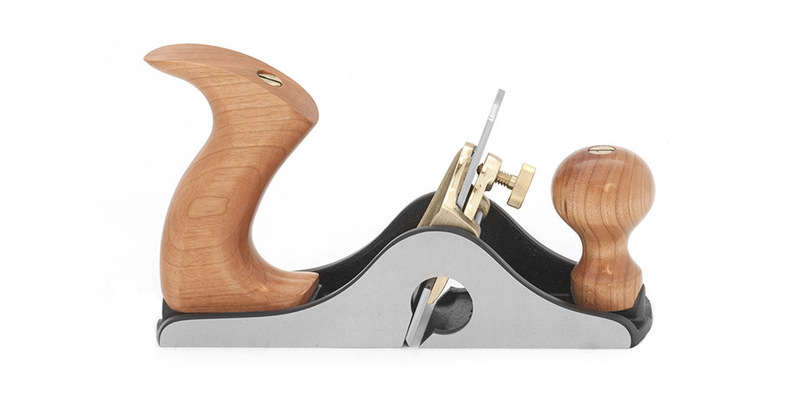 Our Scraping Plane comes with a much thicker blade than the original. This allows the blade to be prepared differently than other scrapers. We have found that our Scraping Plane blades sharpen easily and produce a better surface with a 45° bevel, honed to a sharp edge like a plane blade. Honing a secondary bevel of 5° will help achieve a razor edge quickly. We do not recommend using a burr, at least until you get used to using the tool. Slightly rounding the corners of the blade with a stone will prevent them from marking the work. If you wish to create a burr, hone the blade, then hold upright in a vise. Using a burnisher, begin by holding the burnisher at about 45° to the blade, working up to 75°. Work the edge until you can feel a distinct ‘hook’ all the way across. Be very careful not to cut yourself on the upright blade. Use of a burr will give more aggressive cutting action. When the frog is in the correct position, the back of the blade should contact the back of the mouth on both sides. If adjustment is necessary, install the blade in the frog, and move both to the rear until the back of the blade contacts the body. Then tighten the two fillister head screws to lock the frog in place. The single set screw is then tightened a bit. This puts tension on the frog assembly, preventing the fillister screws from loosening. The blade is inserted with the bevel facing the handle. 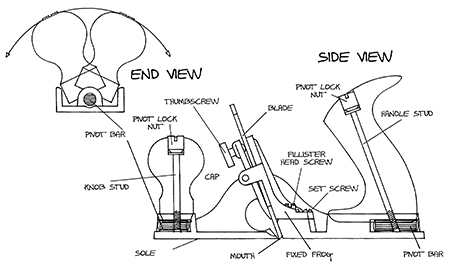 To set the depth of cut, lay the sole of the tool on a flat surface and loosen the thumbscrew. Press lightly on the top of the blade with your thumb and re-tighten the thumbscrew. Do not over tighten. Usually, this will be enough exposure for a fine shaving. If not, repeat with a slip of paper under the front of the tool. Minor depth adjustments may also be made by lightly tapping the top of the blade with a burnisher or light hammer while the tool is resting on a flat board. 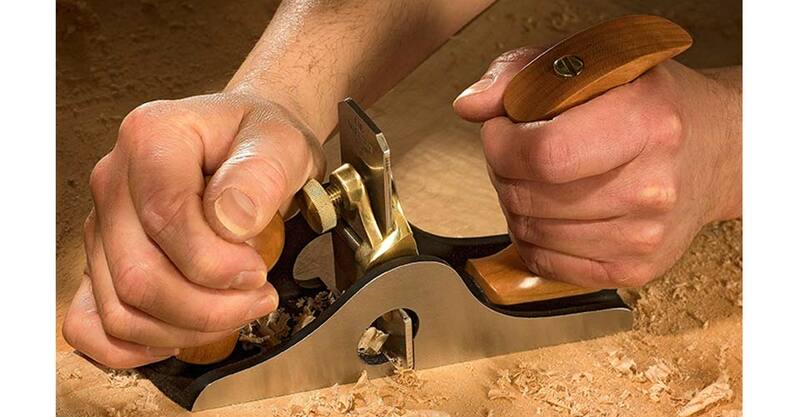 Handle the Cabinet Maker’s Scraper like a Bench Plane. Use a light touch, rather than trying to remove too much material at once, or using too much downward pressure. Too aggressive a cut (blade set too deep), or too much downward pressure will result in chatter — you should be taking light strokes. Often it is helpful to scrape at an angle to the grain, and then from the opposite angle. We offer replacement blades, and toothed blades of 18 and 25 teeth per inch. Toothed blades are useful (before using the regular blade) when working extremely difficult woods, because they score fibers in a criss-cross pattern. They are also used to prepare surfaces for gluing, as in veneering, by lightly roughening the surface. Loosen the nuts on top of the knob and handle to tilt to one side or the other. Tighten the nuts, being careful not to overtighten. Lubricate the pivot bar occasionally. The body is cast from Ductile Iron, a very strong alloy that will take a lot of abuse. These castings are fully stress-relieved, a process that removes inherent stresses and ensures that the tool will remain flat and true. The cap and frog are Manganese Bronze. Other parts are Brass and Steel. The body casting is ground dead flat to a tolerance of .0015". Depending on how much use your tool gets, an occasional light sanding with 320 grit or finer wet/dry paper on a flat surface will keep the sole in as-new condition. Tools with Iron bodies should be kept lightly oiled or waxed to prevent rust. We recommend Jojoba Oil, a plant based oil product that is non-toxic, odor-free and easy to use. Also, in our shop, we use a fine abrasive handblock to remove any light surface oxide from tool bodies and blades. Jojoba Oil and abrasive handblocks are available from us.